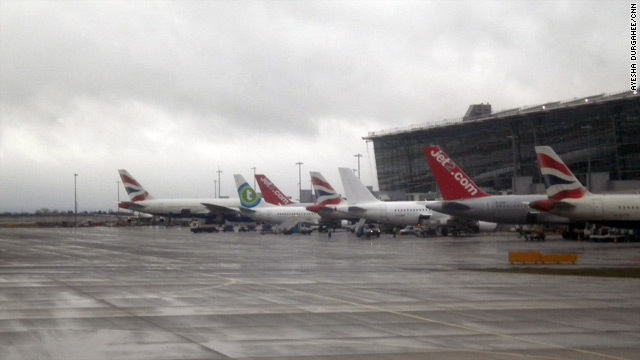 Tail fins of leased planes line up at Heathrow's Terminal 5, where BA's livery is normally the only colors on display. London, England (CNN) -- The head of the union which has called a strike of British Airways cabin crew said Sunday he was appealing to the airline's board of directors to reopen talks to prevent further stoppages as the industrial action entered its second day. Unite union chief Tony Woodley said in a letter to the 95 percent of 15,000 BA staff he represents that he wanted the board to intervene over the airline's plans for reorganization to avert a four-day strike on March 27. His call came as the union claimed heavy disruptions to services during the three-day strike which began midnight Friday, despite BA claims that a better-than-expected turnout by cabin crew had allowed them to offer a good service. "Today, I will be appealing to British Airways at board level to take matters in hand and restart negotiations to reach an agreement which would allow the strike scheduled for next weekend to be averted and put your airline on the road to recovery," Woodley wrote.
" I know that is what you all want, and it is what the travelling public expect." Unite earlier claimed success in halting British Airways services, describing Terminal 5, the BA hub at London's Heathrow Airport, as a "ghost town." In a statement posted on Twitter on Saturday, the Union added: "Eighty percent crew are backing the strike -- same number who voted for it. Two thirds of BA's normal scheduled flights not flown today." BA said it had managed to reinstate canceled flights to run more than 60 percent of its schedule on the first day of the three-day stoppage as more staff than expected showed up for work. Union rallies were continuing outside Heathrow on Sunday, but BA said it intended to maintain a 60 percent service from the airport and its other main hub at Gatwick, south of London, and was satisfied that contingency measures were working. "The operation is working very well, in fact we're doing better than expected," the airline's CEO Willie Walsh said in a statement posted Saturday on its Web site. "We're carrying all of the customers who we had promised to fly today. So I'm really pleased the contingency plans have worked, in fact they've worked better than I thought." British Airways has drafted in an army of volunteers to staff flights and has leased aircraft and crew from other airlines to operated scheduled services. Passengers interviewed by CNN after taking a BA flight from London to Atlanta on Saturday said the journey had been smooth and offered praise for the level of service they received in flight. Walsh and Woodley met late into the night Thursday and again Friday, but failed to reach a compromise to avoid the strikes.